Clearly the science is settled so far as the IPCC is concerned. Or maybe they don’t want a discussion of recent peer reviewed literature which casts doubt on their pet greenhouse theory? Asks some serious questions of the mainstream theory, and until these are answered, the science is most definitely not ‘settled’. But the executive summary has a section on ‘treatment of uncertainty’. Let’s be realistic. No matter what, the IPCC is NEVER going to change its views.It simply could not climb down, even in the face of overwhelming evidence, because is has persuaded so many governments and others that it is right, and there is and never has been any real uncertainty. The IPCC will die in a ditch to defend its position. If there is any change in thinking, it will have to by-pass the IPCC, and emerge from a different direction, perhaps via a different official body of some sort. This is human nature, not some AGW evil. I don’t think this is what you say it is. Radiative Forcing is not being excluded as much as I can tell. I’m reading that paper by Nikolov and Zeller, and man, I can’t see why the IPCC would feel any need to address it. The paper is embarassingly bad, and ignores a tremendous amount of thermodynamics that we learned in the 1800s. It ignores heat flow and radiation budget. These control temperature in the long run, which affects pressure. So the ipcc ignors radiative forcing, which I don’t thiink they are really going to do, and presents an article that ignors radiative forcing also. Says its not needed. Seems a contradiction to me. The troposphere shrinks and expands according to the available solar energy. The temperature in the stratosphere depends only on the amount of ozone. The Mg II data are derived from GOME (1995-2011), SCIAMACHY (2002-2012), GOME-2A (2007-present), and GOME-2B (2012-present). All three data sets as well as the Bremen Mg II composite data are available (see links below). In late years the GOME solar irradiance has degraded to about 20% of its value near 280 nm in 1995, so that the GOME data have become noisier. The most recent information on our Mg II data can be found in Snow et al. (2014). Ozone photochemistry is driven by the interaction of the Sun’s radiation with various gases in the atmosphere, particularly oxygen. The understanding of the basics of ozone photochemistry began with Chapman (1930), who hypothesized that UV radiation was responsible for ozone production and proceeded to lay the foundation of stratospheric photochemistry: the Chapman reactions. He proposed that atomic oxygen is formed by the splitting (dissociation) of O2 by high energy ultraviolet photons (i.e., packets of light energy with wavelengths shorter than 242 nanometers). Because oxygen and ozone molecules are rapidly interconverted, atmospheric chemists regard the sum of ozone and oxygen atoms as a “family” known as odd oxygen (see the dashed box on the right hand side of Figure 5.05). The source of odd oxygen (denoted by Ox) is the photolysis of oxygen molecules (a relatively slow process with a time scale of many weeks at 30-km over the equator), and the loss of odd oxygen is the reaction of ozone and oxygen atoms (also a slow process with a comparable time scale). The time between creation and destruction (referred to as the lifetime, see section 3.4) of Ox is much longer than the lifetime of either O3 or O individually because of this rapid interconversion. All the ozone in a given air parcel is destroyed many times over during the course of a single day when the parcel is in sunlight. Indeed, at an altitude of 30 km above the equator, the lifetime of an ozone molecule due only to UV photolysis is less than 1 hour. However, ozone is reformed in the parcel at almost exactly the same rate through the reaction between O and O2. Hence, ozone concentrations in the middle stratosphere change only very slowly over the long time scales (weeks to months) of production and loss. Ozone strongly absorbs UV radiation. 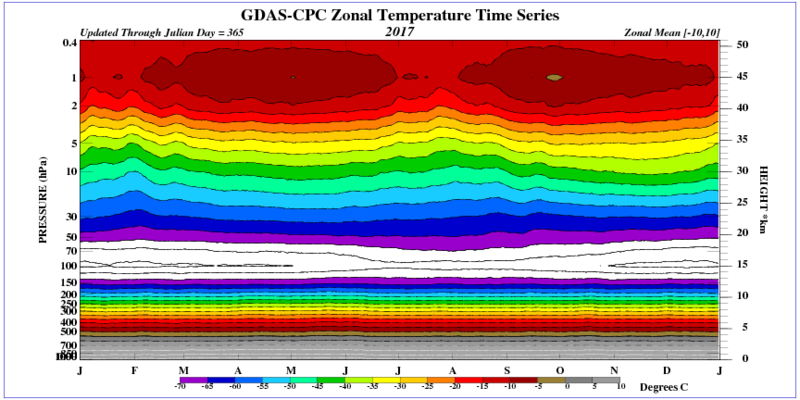 The top panel of Figure 5.01 shows the ozone absorption cross section. As an example, if we looked at the top of the atmosphere and counted only the 250-nm wavelength photons striking a 1-square centimeter area every second, we would count about 6,800,000,000,000 (that’s 6.8 trillion or 6.8 x 1012) photons. Yet ozone is so effective at absorbing these 250-nm photons, that we find zero 250-nm photons at Earth’s surface. In fact, we could sit at the same spot for millions of years without detecting a single 250-nm photon! At these very short wavelengths, the sky is completely and utterly black. Windchaser: We’ve had a number of people badmouthing N&Z here in the past, but your excuse for a critique is even worse than the others who failed to provide substantive argument to back their casual dismissals. Dismal. Well, can you point me to where N&Z do address long-term heat transfer? Or can you explain how this doesn’t govern temperature (and thus pressure) in the long-term? I don’t care about insults. Show me the scientific reasoning. The appropriate tropospheric density causes the average temperature to be strictly dependent on the pressure at the given altitude. At a fixed density, sure, temperature is only dependent on pressure. Or you could equivalently say that pressure is only dependent on temperature. Both are true. The Ideal Gas Law only tells you the relationship between temperature, pressure, and density. E.g., “if you pressure is X, and density is Y, then temperature is Z”. But it doesn’t tell you what drives any of these factors. It doesn’t explain why pressure is X and density is Y. On the other hand, radiative equilibrium tells you what the temperature will be, and explains how it’s a function of albedo and insolation (in the absence of greenhouse gases). According to Eq. (10b), the heating mechanism of planetary atmospheres is analogous to a gravity-controlled adiabatic compression acting upon the entire surface. This means that the atmosphere does not function as an insulator reducing the rate of planet’s infrared cooling to space as presently assumed [9,10], but instead adiabatically boosts the kinetic energy of the lower troposphere beyond the level of solar input through gas compression. Hence, the physical nature of the atmospheric ‘greenhouse effect’ is a pressure-induced thermal enhancement independent of atmospheric composition. This mechanism is fundamentally different from the hypothesized ‘trapping’ of LW radiation by atmospheric trace gases first proposed in the 19th century and presently forming the core of the Greenhouse climate theory. However, a radiant-heat trapping by freely convective gases has never been demonstrated experimentally. We should point out that the hereto deduced adiabatic (pressure-controlled) nature of the atmospheric thermal effect rests on an objective analysis of vetted planetary observations from across the Solar System and is backed by proven thermodynamic principles, while the ‘trapping’ of LW radiation by an unconstrained atmosphere surmised by Fourier, Tyndall and Arrhenius in the 1800s was based on a theoretical conjecture. The latter has later been coded into algorithms that describe the surface temperature as a function of atmospheric infrared optical depth (instead of pressure) by artificially decoupling radiative transfer from convective heat exchange. Note also that the Ideal Gas Law (PV=nRT) forming the basis of atmospheric physics is indifferent to the gas chemical composition. This means that the atmosphere does not function as an insulator reducing the rate of planet’s infrared cooling to space as presently assumed [9,10], but instead adiabatically boosts the kinetic energy of the lower troposphere beyond the level of solar input through gas compression. You can get a temperature increase from gas compression once for a given pressure. Then, after the temperature is increased, the heat is lost, radiating away to space. (An increase in temperature means that outgoing radiation increases and heat is lost more quickly). Losing heat, the temperature declines until incoming and outgoing radiation are balanced. Gas compression is not an endless source of free energy, and cannot explain how the temperature would remain artificially high for an indefinite period of time. As well as the heating caused by gas compression, pressure increases density at a given temperature. Temperature is the result of the kinetic energy per unit volume, and if you have more molecules per unit volume, absorbing energy from a given throughput of solar energy in and LW radiation out, then you have a higher amount of kinetic energy in that volume, and a higher temperature. That higher temperature will of course cause inflation of the atmosphere, thus lowering the density again to a small extent, but this is a minor, secondary effect. 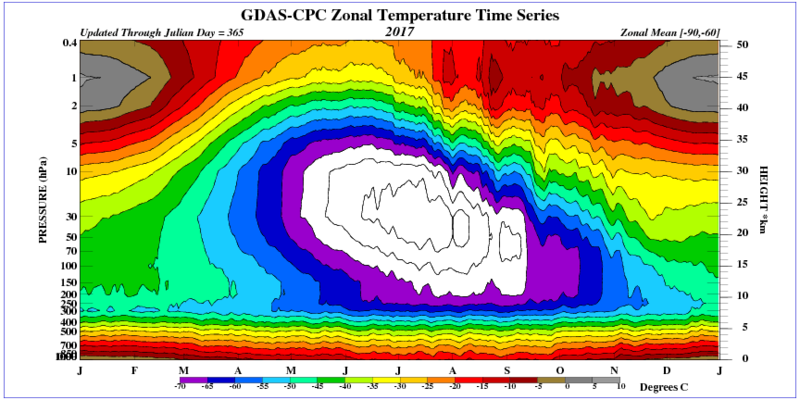 Atmospheric mass along with solar insolation determines how much higher Tsurface exceeds Temission at the top. You need some IR activity to shed the heat into space and set up the differential for convection to operate. Once the atmosphere is convecting, the mass determines the heat budget, not changes in the amount of IR active gases. N&Z show this from planetary observations. IR activity in insufficient by itself to raise Tsurface, it needs the atmospheric mass. During El Nino evaporation increases the mass of gas in the troposphere. This can be seen after the temperature increase in the tropopause. Ron C: There will always be a gradient for convection to operate in because the density gradient produces a temperature gradient anyway. Radiation to space increases that underlying gradient. Water vapor increases reacting to infrared energy which works its way out of the earth’s atmosphere eventually. The increased wv slows the escape of IR into the upper atmosphere and also increase return of IR to the surface of the earth. Earth is not a perfectly insulated body to hold in energy. Plus as the temperature increases the atmosphere actually becomes less dense. Airplanes cannot be used above a certain temperature due to lower denistyyy of the atmosphere to leave the runway. However, this effect is not completely visible in the lower stratosphere, where convection does not work. Once the atmosphere is convecting, the mass determines the heat budget, not changes in the amount of IR active gases. Mass doesn’t determine the heat budget of the atmosphere. In the long run, heat lost by radiation to space will be equal to the heat absorbed from space or the heat generated internally (which is negligible). Can we agree that the amount of radiative energy loss is determined by the S-B Law, and that a higher-temperature body will radiate heat away more quickly? What happens when you heat an atmosphere by compression? It will radiate away that heat to space, yes? Because outgoing radiation increases, but incoming radiation stays the same. Incoming radiation stays the same? How about solar cycles, orbital changes, global dimming and brightening? There are always fluctuations, including internal ones like oceanic oscillations. But the balance point seems steady in the midst of changes. Okay, sure, sometimes incoming radiation naturally changes. But that’s beside the point — when you increase the temperature of a planetary surface, this doesn’t cause the incoming radiation to change. But it does cause the outgoing radiation to increase, so heat is lost, so the temperature decreases again until the two are in balance. Look at the range of influence of stratospheric polar vortex during winter. That is why changes in the amount of ozone are of great importance. These changes occur in long trebles depending on the amount of sunspots. These changes take place over long periods of time depending on the amount of sunspots. A problem that I and others have with N&Z is that the pressure generated heat would seem to be one off rather than ongoing (like the stroke of a bicycle pump). How do they explain the continuous nature of the warming? Could TSI have something to do with it as it enters the previously dark region of the planet? But this is still only a pulse at that planetary position. Please could someone explain? This is part of the reason why, if you have a higher pressure on one side of the ideal gas law equation, you’ll have a higher temperature on the other. Temperature is the result of the kinetic energy per unit volume, and if you have more molecules per unit volume, absorbing energy from a given throughput of solar energy in and LW radiation out, then you have a higher amount of kinetic energy in that volume, and a higher temperature. If you compress a gas (like in a bicycle pump), then density increases and initially temperature increases. But if held at that pressure, then over time, the heat is lost and temperature declines to that of its surroundings. In the case of a celestial body, the higher temperature means that outgoing radiation increases (with the 4th power of temperature, so, pretty quickly). The loss of heat means that temperature declines again. Compression heating is not a recipe for free energy. Thermal energy diffuses away. Forget the compression for now, address the point about density. There’s no reason the higher temperature in a denser gas will ‘dissipate’ so long as energy continues to flow through it from the Sun and back out from the Earth. It’s an ongoing dynamic process. Denser gas has higher kinetic energy per unit volume. That’s just the way it is in thermodynamics, as the ideal gas law tells us. No ‘free energy’ involved. August 9, 2017 at 9:26 pm: Your talk of ‘compressing an atmosphere’ is where you go wrong. It is not confined, only constrained by gravity. The ideal gas law is not affected by gas specie, please do understand that. The ‘Poisson relationship’ makes up that Law. Only gravity change alters compression heating, and only solar input powers it. All else is fluff and a repeat of past time-wasting. What happens to contained gases (and their containers) is irrelevant, and handled by Engineering Handbooks. Warmist mention of Fourier Tyndall and Arrhenius for instance is proven to be misrepresentation of what they wrote. There is no other basis for AGW claims, in point of fact. Nor do we say Compression heating is free energy. It is anyway balanced by ‘expansion’ above the median height. Please stop making false claims. There’s no reason the higher temperature in a denser gas will ‘dissipate’ so long as energy continues to flow through it from the Sun and back out from the Earth. Yes, heat will still flow from hot to cold, even from a denser medium. For a radiating body, the rate of outgoing heat flow is determined by the Stefan-Boltzmann equation, so if the body heats up, it loses heat faster. (Similar principles apply for conductive heat loss, too). Denser gas has higher kinetic energy per unit volume. Kinetic energy per unit volume is dependent on both temperature and density, yeah. The amount of kinetic energy in a parcel of gas is directly proportional to the temperature of the gas times the number of molecules. But density and temperature are two separate things. Be careful about conflating them. A higher density doesn’t mean a higher temperature, as we can readily observe from cool compressed gases. The ideal gas law is not affected by gas specie, please do understand that. Not quite true, as the ideal gas law assumes non-interacting particles (no condensation or molecular reactions; a low fugacity), but… honestly, I’m being pedantic here. :-p For the sake of this discussion, yeah, the ideal gas law holds. Your talk of ‘compressing an atmosphere’ is where you go wrong. It is not confined, only constrained by gravity. Gravity most certainly compresses our atmosphere. It’s why we have an atmosphere at all; gravity holds and compresses the gaseous atmosphere close to the surface of the planet. The compression creates the air pressure. …I’m not sure where you’re going with this. The difference between a hard and soft constraint on a gaseous system isn’t really relevant to my point. Only the fact that warmer bodies lose heat more quickly than cooler bodies. Check out the density and pressure graphs at tropospheric height here. No obvious difference in the shape of the curve. OB Yes, as I said, temperature affects density, but not very much. However, density affects temperature quite a lot. Windchaser: Kinetic energy per unit volume is dependent on both temperature and density, yeah. The amount of kinetic energy in a parcel of gas is directly proportional to the temperature of the gas times the number of molecules. In terms of thermodynamics in the planetary atmosphere, you have this back to front. The temperature is dependent on the kinetic energy and density, not the other way round. Stop cocking about. I already specified the same Solar energy input. All else being equal, a higher pressure and therefore higher density gas will contain more kinetic energy per unit volume. And that will cause it to be at a higher temperature. if the body heats up, it loses heat faster. (Similar principles apply for conductive heat loss, too). And radiative heat loss too. So by your argument, extra CO2 can’t make the atmosphere any warmer either. (Think about it). All else being equal, a higher pressure and therefore higher density gas will contain more kinetic energy per unit volume. And that will cause it to be at a higher temperature. No. Pressure does not determine temperature unless you also specify density. And higher pressure doesn’t mean higher density, either. The Ideal Gas Law deals with three different variables: pressure, density (n/V), and temperature. Each of these is distinct. Higher pressure does not mean “therefore higher density”. You can have a high-density, low-temperature gas. You can have a high pressure, low-density (hot) gas. Greenhouse gases specifically mess with the rate of radiative heat loss — that’s the whole point. Do you agree that a hotter surface radiates away more heat than a colder body, and this heat loss is governed by the S-B law? Yes or no. Yes, using my University textbook, I see that Temp (or the KE behind it) is the driver. Warmistas start bass ackwards and only get worse from there on. We have a foehn wind adding 5C to the central eastern North Is NZ right now in midwinter. That is from entrained air lifted over mountains that loses its WV. Radiation should have zapped that heat to space, surrounded as it was by chilled air. Instead it is dragged down by mass flow to greatly please the good folk of Hawkes Bay NZ. Reverse uplift. When it is the normal uplift which gets most of the incoming solar energy away to where it can radiate. Meteorology 101, based on the relative weakness of radiation vs convective mass flow in atmospheres over 0.1bar (hence the -ve 4th power involved). SB was formulated for vacuums. EMF is a vector force, and needs a downward gradient. AGW is an unfounded belief, but has been profitable for some. The rest are dupes. There seems to be some general confusion as to the thermodynamic behavior of the earth’s atmosphere (or any atmosphere with significant mass). First, temperature only reflects the kinetic (thermal) energy in the atmospheric system. But kinetic energy is only a part of the total internal energy of this system. Second, thermal energy due to gravitational compression does not diffuse away, but it can be transformed to another form of energy. I will copy the relevant part of this post below. The differential for the work term is PdV since the atmosphere is a constant pressure system and VdP = 0. The sign for PdV is negative since I am assuming that work is being performed by the system to the surroundings. Let’s also specify that all terms are expressed as intensive properties (Q is in joules per unit mass and PV is an intensive property in its self – no moles allowed here). If we define the system described in (4) as an air parcel, then certain things must happen if any of the terms become > or 0) and the parcel will expand (dV > 0) doing work on the surroundings. But that work energy (PdV) must come from the existing internal thermal energy (CvdT) thus leaving CvdT smaller (cooler) than it would have been if expansion did not occur. At the same time the parcel, having expanded, becomes buoyant and rises. That work energy is now converted to gravitational potential energy (gdz). The internal energy (U) of the parcel is still the same as it was when it first received heat energy from the surface but CvT is now smaller and gz is larger (an isentropic or adiabatic process). The density is also smaller because the parcel expanded (but who cares?). This process continues as long as the parcel rises. The opposite scenario can occur if an elevated parcel is cooled (from radiation to space? ): the thermal energy is decreased (CpdT), the parcel is compressed (+PdV) from the mass above it and it descends, and the gravitational potential energy (gdz) decreases. But the total internal energy (U) remains constant as it descends (isentropic/adiabatic process). The density is also larger due to volumetric contraction (but who cares?). which is the classic formula for the dry adiabatic lapse rate. (This also explains why Cp and not Cv is the correct term for the Loschmidt equation). So the thermal gradient observed in the atmosphere is nothing more than the result of the conservation of energy via isentropic processes (constant entropy) with PV work driving the processes. The Helmholtz free energy is zero and the system is at equilibrium (U = constant) even though a temperature gradient exists. Temperature is only a measure of one form of energy in the atmosphere and thus can only be a partial descriptor of the atmospheric thermodynamics. For example, at 10 km height, gravitational potential energy accounts for 30% of the total internal energy (based on the 1976 Standard Atmosphere). And if we are dealing with a moist atmosphere, we have to include a term for the latent heat of vaporization, which can be a very sizable number in itself. Since radiation heat transfer only deals with one term of the first law (CvT), it cannot adequately be a primary predictor of atmospheric behavior. The radiative properties of the atmosphere are a function of the non-radiative processes occurring in the atmosphere, not the other way around. So it is mass transfer under the influence of an electromagnetic field and a gravitational field that determines the thermal properties of the troposphere. There is a continual trade-off between thermal energy, gravitational potential energy and PV work energy that determines the thermal profile. The only role that radiation heat transfer plays is to determine the total internal energy within the atmospheric system (solar radiation in versus IR radiation out). Radiation heat transfer within the troposphere is an “effect”, not a “cause”. And I will have to admit, gravity is free. I just hope nobody gets the idea of a “gravity tax” to go along with that “carbon tax”. Geez guys, your discussion on P=density*R*T worked out beginning with container experiments by Poisson in the early 1800s does not hold for the free atm. Anywhere. Pick any weather station of your choice. Necessarily any one that has density, temperature and pressure graphs v. time of day. You will always find that sometimes temperature goes up when pressure goes down & sometimes temperature does go up when pressure goes up. To write pressure always goes up in lockstep with temperature and vice versa you are only correct at constant density.. The weather station will not indicate constant density all day or find one. No, R is a constant specific to each gas specie found from experiment. NOT at constant density. Now if the weather always presented constant density all day most days you could write something relevant. Well no if all else being equal only means same temperature. You could have two 1 unit volume 1m^3 containers of air at 1bar and 0.1bar and both be at room temperature at equilibrium, but the one has lower pressure and higher density. Both gases contain same avg. KE per unit volume in that case as they are both the same temperature. If all else being equal also means same mass of air in both, you get a different story. My point again as above is that you need to specify which independent variables (of the 3 in P=density*R*T or 4 in PV=nRT) is held constant. If density is constant, THEN you can specify something about P and T moving same direction in the control volume of interest (say your unit volume). Air density being constant is just not ever found in weather station data so the constant density container case IS mostly irrelevant in climate discussions. Trick – in other words, you have nothing. William G at 12.48am. Thanks for reposting your comment from the famous Loschmidt thread and the link to your paper. 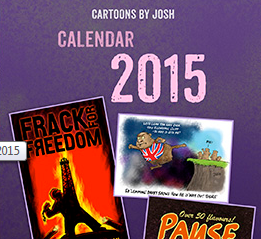 A good reminder that we’ve been into these issues in depth for years here on the talkshop. Please stick around to help dispel the misconceptions that still abound around this subject. In a thick troposphere the convection regulates the temperature. In the troposphere, all gases are of equal importance. “A thermal column (or thermal) is a vertical section of rising air in the lower altitudes of the Earth’s atmosphere. Thermals are created by the uneven heating of the Earth’s surface from solar radiation. The Sun warms the ground, which in turn warms the air directly above it. 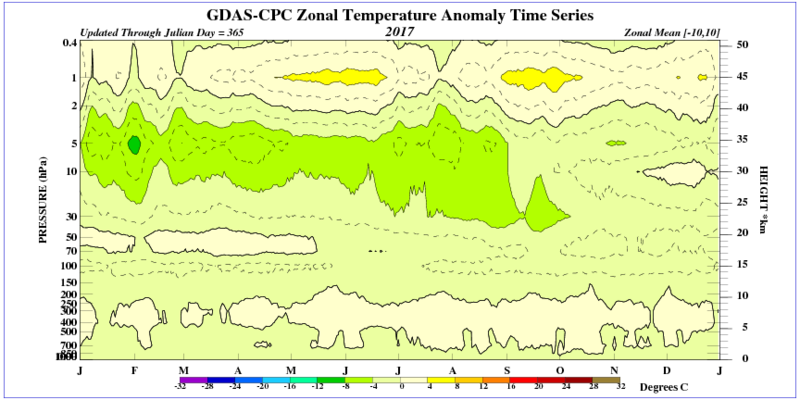 The warmer air expands, becoming less dense than the surrounding air mass, and creating a thermal low. The mass of lighter air rises, and as it does, it cools by expansion at lower air pressures. It stops rising when it has cooled to the same temperature as the surrounding air. Associated with a thermal is a downward flow surrounding the thermal column. The downward moving exterior is caused by colder air being displaced at the top of the thermal. Another convection-driven weather effect is the sea breeze. Vertical structure of the atmosphere of Jupiter. Note that the temperature drops together with altitude above the tropopause. The Galileo atmospheric probe stopped transmitting at a depth of 132 km below the 1 bar “surface” of Jupiter. Good one Ren. The various brilliant expositions of gravito-thermal should have done the ‘Trick’, but there is an ‘Alice in Wonderland’ effect at work. Some people are so far down the rabbit hole, they have gotten to love their darkness. That Nasa has the proving data, is like a full circle. I just noticed that the paragraph below equation (4) in my above comment is garbled. I think the problem is that I used the algebraic symbols for “greater than” and “less than” and WordPress thought I was inserting “html” code. The same thing happened in my 2012 post but I didn’t notice it. The Gravito – Thermal theory: The sun warms the surface, which warms the air above, which rises until the temperature falls by adiabatic decompression until, as if by magic, more heat is lost, which causes the air to sink toward the surface. In an atmosphere without greenhouse gases, what sets the temperature of the surface? If it’s not radiative equilibrium, what is it? But a gas with a higher density also has more molecules per unit volume, and so doesn’t necessarily have more KE per molecule, which is what determines the temperature of the gas. Good question. I’d also like to know. Radiative equilibrium is one of the several requirements for thermodynamic equilibrium, but it can occur in the absence of thermodynamic equilibrium. There are various types of radiative equilibrium, which is itself a kind of dynamic equilibrium. The big, big problem with these trolls is that Nasa JPL (under a fellow Kiwi) itself provided the data proving the G-T hypothesis. What makes them trolls is to oppose data with supposition, rooted at Nasa New York. As if the data has not trumped them totally. Waste of space…. Scientific hypotheses, and even scientific theories, are not truth; they can be, and often are, wrong.